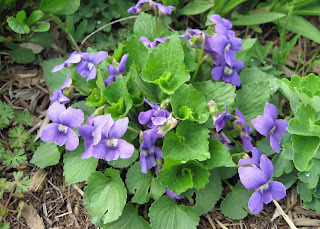 Now that Garden Bloggers' Bloom Day for April is past, some of my flowers, like these woodland violets, have decided to really bloom. And having been to every Garden Bloggers' Bloom Day post that is out there, I can emphatically say that many gardeners have flowers really blooming right now. I really did try to visit every bloom day post and leave a comment. If you posted for bloom day, and I didn't leave a comment on your blog post, please let me know. I either goofed up leaving the comment (highly probable), or I inadvertently skipped a comment. Also, there won't be a separately posted link list to all the bloom day posts like last month. MSS at Zanthan Gardens left a comment that convinced me not to do it. She said that she likes to use the comments so she can see the bloom day posts "in context". It didn't take much to convince me to abandon the link list idea because there were well over 100 bloggers who posted about their blooms on the 15th. Thanks, MSS, and thank you to everyone who joined us this month. Yes, we'll do it again on May 15th. If, by chance, you were waiting for a link list before you went around to visit the other bloom day posts, you can still find them all by going to the comments on my bloom day post and following the trail to each blog. Buried in those bloom day comments, by the way, is a comment from The Garden Monkey letting me know that I've been nominated for a Fork'n Monkey award for "Most Interesting Self-Portrait". Someone nominated me for it because they think I have a "far fetched gardening outfit" in my blogger profile picture. I don't know if it is far fetched, but it is fetching, don't you think? To vote, as near as I can tell, you just go to the post and leave a comment on my behalf before May 16th. And while you are in a voting mood, don't forget that voting is underway for the Mouse and Trowel awards. You can go to that site and vote until May 13th. In other news here at May Dreams Gardens, the tulips are finally starting to bloom. Here are some tulips in the front that I like. And here are some tulips in the back that I don't like. Too red, too double, too something. I have no recollection of planting these. I must have been in a gardening induced trance or I got some mis-labeled tulips. Or maybe the garden fairies, led by Thorn Goblinfly, planted them? Most of the time, if I plant out a bed of tulips like I did in front, I pull them out when they are done blooming and plant something else there for the summer. 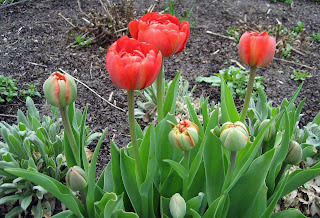 But when I plant clumps of tulips here and there, like I apparently did with these double-red tulips, I leave them alone and if they come up the next year, great, more tulips. But I don't really want to see these tulips again next year, so I think I'm going to pull them up when they are done and compost them. Wouldn't you? OOooohhhhh I don't think I could pull out this nice clump of tulips. If you don't like them go right ahead and pull but if it were me...I would leave them until they start getting spindly and thin looking. Then it is off with their heads. 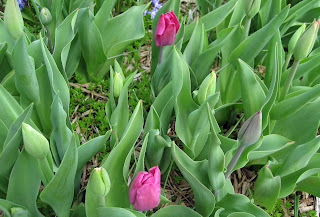 I like these tulips.... they seem to have a rose or peony-like quality. Wish I was your neighbor--then you could give them to me. I have a hard time pulling them out. But when the clump has dwindle to one or two buds, then I yank or dig. Unforunately yI can never seem to get all of the baby bulbs and they keep coming up. Nooooooooooo -- don't kill them! Move them, or give them away, but don't compost them. Aaack! (Can you tell I have a problem? I simply cannot kill or pull out anything if it's even hanging to life by a single thread. Which is a BAD thing. But seriously, you could dig up the bulbs and give them to a friend who has those colors. I think they are lovely, but if they don't work, I get it. I have a magenta nicotiana that I just planted and now I realize it is in front of two red red turk's caps. They aren't blooming yet, but that will NOT work....gotta figure that out .... Good luck! I think it's great that you make such an effort for Garden Blogger's Bloom Day. It is fun to see blooms from many areas on the same day. You know, you could try to use the tulips as rabbit bait. Ours seem to love tulips...Which does restrict where they can be planted. I would gladly take those red tulips off your hands! Let's see the last time I came to Indy (about 120 miles away), I drove my minivan which gets only about 20 mpg. At $3.42 for a gallon of gas, that would mean....hmmm, I would spend about $42 to pick up those tulips. Maybe I should just pick up some bulbs here this fall instead. I am in awe of how quickly things are blooming after a few warm days. It's about time, I say! The tulips here are beginning to bloom and the pear trees are in full bloom. I mentioned your smelly pear tree post tonight. Carol, remember the little sign I gave you that said "I don't remember planting this"? Plant it in your tulip bed. Sounds to me that is the perfect place for it. Sometimes if I don't like the way flowers look in the yard, I cut them for indoors - maybe you'd enjoy them in a vase inside? They can look totally different that way, and tulips are perfect to bring in. I really love your tulips, but there are certain yellow and red ones in my front yard that aren't even going to make the "after they're done blooming" part of your scheme. Maybe I'll like them better in a vase--and eihter way, the plants will be GONE! What gorgeous tulips! I wish I were your neighbor I'd take them off your hands. Maybe you can cut the flowers for a neighbor or friend? I know getting a gift like that would really brighten my day. Carol, I don't know how you do it. You are a gardening wonder woman, you know. You had 120 comments on April 15...that's WILD! Didn't you have unwanted tulips last year too? What's up with you or with the tulips? Perhaps they sell you different tulips than what it says on the label? Is there a tulip conspiracy going on in May Dreams Gardens? Should we re-name it Tulip Nightmare Gardens?